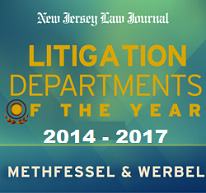 Christian Baillie joined Methfessel & Werbel in 2012 after completing a judicial clerkship with the Honorable Paul A. Kapalko, J.S.C., in the Monmouth County Superior Court, Law Division. He was responsible for conducting research and drafting legal memoranda/opinions, while dealing with a high volume of attorneys and litigants. Christian also served as a court-trained mediator, assisting parties in the settlement of Special Civil Part matters. While at Methfessel & Werbel, Christian has successfully argued dozens of dispositive motions, including Motions for Summary Judgment on complex first party insurance coverage issues. He has been “on the brief” in several successful appeals in first party cases and has tried numerous matters to conclusion. He has drafted hundreds of coverage opinions and coverage positions letters for various insurers. Christian has also published several articles on insurance coverage issues. Christian is a member of the First Party/Property Team, focusing on insurance coverage and insurance fraud disputes, as well as defamation and third party liability property damage matters.